Agfa was a major photographic manufacturer in Germany; like Kodak, their bread and butter was film and consumables, but they also sold a lot of consumer-level cameras and accessories. Yet—like Kodak—they never really got into exposure meters. There are only a few that bear the Agfa name, and it's safe to say they were made by someone else and branded by Agfa. I think it was made by Bertram, as it bears a good resemblance to their Quick and Super. But that's just my opinion. 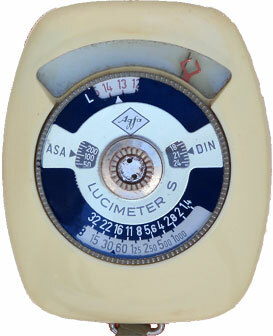 This is the last of their meters, the Lucimeter S (previous models were the Lucimeter, Lucimeter II, Lucimeter M and Lucimat). This one is match-needle with no scale on the face. How to use it: it uses a selenium cell so no batteries to deal with. Aim it at your subject and notice that the needle swngs to the right. Rotate the outer ring on the calculator dial and you'll see the diamond-shaped needle move. Move the diamond needle so that the other needle is in the middle—this is called matching the needles. Once they're matched, you can read the speed/aperture combinations in the lower half of the calculator. Using the example in the photo above, you could use 1/125th at ƒ/8.